Where do I find the Festival Schedule? When the festival schedule is complete, it can be found on the Festival Schedule Page. The Schedule is typically posted in early August. Tickets may be purchased in advance by credit card or pay pal using this link. Once you have purchased your ticket you will receive an email with tickets that will need to be printed and carried with you to the gate. If you do not see this email, please check your spam or junk files in your email folders as sometimes they do get filtered that way. If you still have problems, please email us at bluegrass@thomaspointbeach.com for assistance. At the gate cash is the preferred form of payment for efficiency. What days can I get Multi-Day tickets for? We do not offer Multi-Day tickets in any other combination (2 or 3-Days that do not end on Sunday or multiple non-consecutive days). We do offer Single-Day tickets, which can be purchased for any day, sort of an a-la carte. Can I "Reserve" a site? During our Annual Bluegrass Festival, we do not have any “sites” per se. As we are a Campground, you will often hear people speak of site numbers as a way of giving people landmarks inside of the park, but these site numbers do not necessarily translate to our Festival, as the entirety of the park is used for camping during this event. Standard Overnight Camping (included with Multi-Day Passes) is on a first-come first-served basis, and we do not reserve any locations for these passed. However, Electric Passes (in Designated Electric Zones) do reserve an outlet and appropriate “space” in an Electric Zone. There are no “sites” in these Electric Zones, and specific placement of your Camping Unit will be on a first-come first-served basis, but this is as close to “Reserved” as we can offer for the festival. How Much are (Single or Multi-Day) Tickets? Single Day Ticket prices, as well as Current Multi-Day Ticket prices can be found on our Flyer. Do you offer Senior or Student discounts? Although we do not offer Senior Citizen Discounts, advance ticket purchases are available until will save you money. Click here for ticket sales. Children 12 years old and younger are free with a paying adult and teens 13-17 pay half the adult rate for admission. How do I purchase Electricity or Early Bird Camping? Electricity and Early Bird camping can be purchased at the same time as purchasing your tickets on-line. If not purchasing Electricity, Early Bird Camping is standard first-come first-served camping on the grounds. If purchasing Electricity, you are required to purchase a 4-day Electric and Camping Combo as well. Electric Camping is by designated Zone, you will be reserved an outlet in an Electric Zone, but not a specific “site number” or “spot.” Electric Camping is first-come first-served inside of the requested Zone, and a member of our staff will help you find a suitable location in your requested Zone. Some Electric Zones are better suited for different Camping Units. 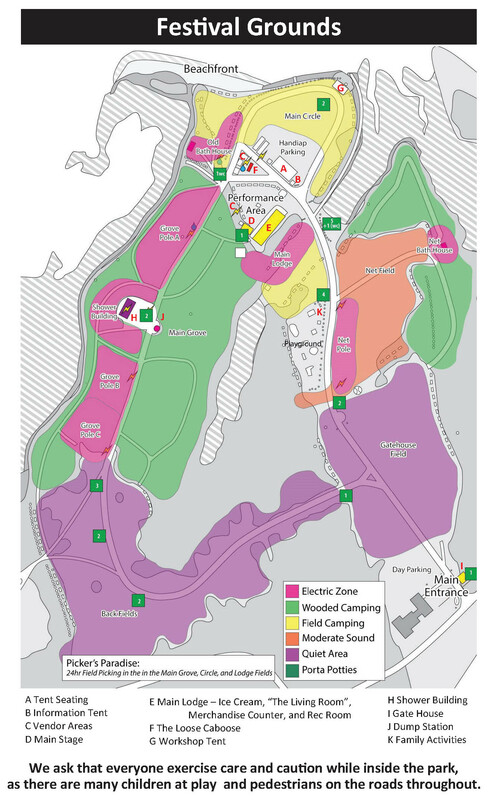 Once you purchase an Electric Pass, you will be contacted by a member of our staff to confirm that the requested Zone a suitable for your Camping Unit. Please note that this is for electricity ONLY. Water hook-up are NOT available. There are fill stations and a dump station for your convenience. How long will it take to check in at the gate? We love check-in, because it is our chance to Welcome You Home! Most of our gate staff have been with Thomas Point Beach for many, many years and they work quickly and efficiently. At the gate you will present pre-purchased tickets you will have printed prior to arrival or a form of payment. The gate team will put your wristbands on, and if you are a multi- day ticket holder you will receive a program, a sticker for your vehicle, and a trashbag to keep our beautiful park looking wonderful! We ask for your patience in the process and do suggest pre-purchasing your tickets for the savings as well as the efficiency. Cash at the gate also makes the process go more quickly. What are my camping options? What camping amenities are available? Free rough camping is included when you purchase a multi-day ticket for the nights of the event. “Rough” camping simply means a field or grove camping with no additional amenities such as power or water. Camping areas are designated as “Picker’s Paradise-24 Hour Field Picking”, “Moderate Sound Levels- quiet from 2 am- 6 am”, and “Quiet Camping- Sound curfew from 10 pm” A map is available to assist you and we have staff that can direct you. Early Bird camping is available for those arriving prior to the start of the festival for $25.00 per site starting Saturday, August 24. Limited sites with Electric are available for an additional $10 per night for the length of stay. Electrical sites require an 8 night stay to reserve. (Sunday, August 25- Monday, September 2) We ask that all campers with reserved sites be physically checked in no later than Monday, August 26. Occasionally there will be a few sites available without a reservation, you can ask at the gate, but we do highly recommend reserving in advance. Reservations for Electrical sites are made HERE. Generators are permitted from 8 AM- 10 PM ONLY. Please be considerate of neighbors. Water hook-ups are NOT available at any sites. There are a variety of water fill stations available through the park. Thomas Point Beach has a limited supply of picnic tables and fire rings available for use on a first, come first serve basis, however these are not guaranteed. Hot Water Inside Showers are available. These are coin operated and require quarters to operate. A cold water outdoor rinse off shower is available on each of the other bathhouses. A laundry facility is available at the Shower building with one washer and one dryer. An Outdoor sink is available outside of each of the three bathhouses for your convenience. A Dump Station is available. The cost to use the Dump Station upon arrival is $25. There is no charge for use of the dump station when you leave the park. Three Restroom buildings are available throughout the park with flush toilets and sinks. Additionally there are Port-A Potties throughout the park. Free rough camping is included when you purchase a multi-day ticket for the nights of the event. “Rough” camping simply means a field or grove camping with no additional amenities such as power or water. Camping areas are designated as “Picker’s Paradise-24 Hour Field Picking”, “Moderate Sound Levels- quiet from 2 am- 6 am”, and “Quiet Camping- Sound curfew from 10 pm” A map is available to assist you and we have staff that can direct you. Early Bird camping is available for those arriving prior to the start of the festival for $25.00 per site starting Saturday, August 25. Limited sites with Electric are available for an additional $10 per night for the length of stay. Electrical sites require an 8 night stay to reserve. (Sunday, August 26- Monday, September 3) We ask that all campers with reserved sites be physically checked in no later than Monday, August 27. Occasionally there will be a few sites available without a reservation, you can ask at the gate, but we do highly recommend reserving in advance. Reservations for Electrical sites are made HERE. Thomas Point Beach has a supply of picnic tables and fire rings available for use on a first, come first serve basis, however these are not guaranteed. Is handicap parking/ facilities available? Yes, there is a limited handicap parking area available. A golf cart shuttle from our day parking area is also offered, however patience is asked for as you wait for the shuttle to make trips to and from the stage area. There are Handicap Bathrooms available in the Main Grove Shower Building and a Handicap Port-A-Potty near the stage area. Are dogs welcome at the festival? Camping dogs ONLY are welcome at the festival. There is a registration fee and they must wear their wrist band on their collar at all times. Dogs are only allowed at your campsite and can be walked on the access road. Dogs are NOT allowed in the public areas including the stage and seating areas, vendor areas, beachfront, and playground. Please clean up after your dog at all times. Excessive barking is grounds for removal from the park. We appreciate your cooperation. Day ticket holders may NOT bring dogs into the park and we will not allow dogs being left in vehicles in the Day Ticket Lot. For the safety and comfort of our guests and your furry friends, dogs are NEVER allowed in the seating area. There are two seating areas. One is open air and closest to the stage. The other is a large tented area behind the main seating. Guests should bring their own lawn chairs. We ask that NO HIGHBACK chairs or RECLINING/ Foot chairs be used. Chairs that block the views of other guests will be removed or moved to the back of the seating area. In bluegrass festival tradition, we do encourage you to allow others to use your chairs when you are not sitting in them. They will kindly move when you return to your seat. Additionally, our own Loose Caboose is open throughout the night offering hot dogs, coffee, and a variety of snacks. Grocery items are not available on-site, but convenience and full service grocery stores are located only minutes from the gate. 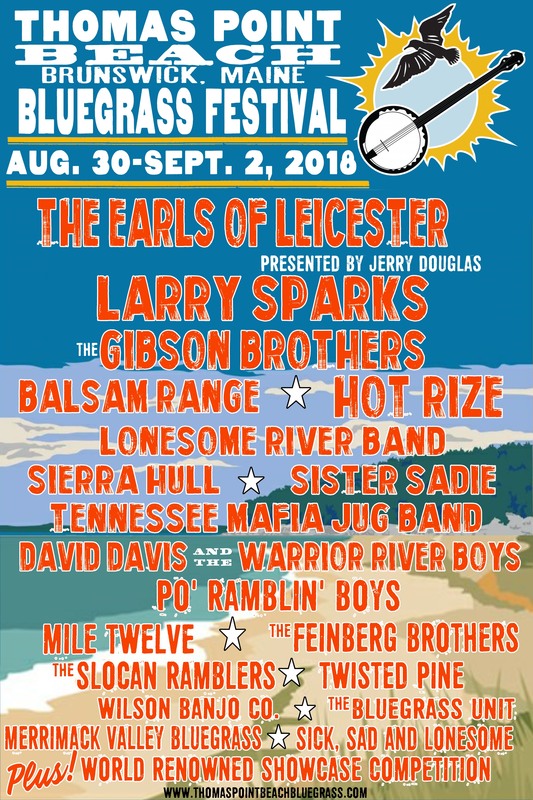 How can we get booked at the Thomas Point Beach Bluegrass Festival? Please send any booking inquiries to bluegrass@thomaspointbeach.com. All slots are full for this year’s event, however, we are accepting applications for the annual Showcase Competition that takes place Thursday of the festival. The Showcase Competition is a wonderful opportunity to introduce your band to the Thomas Point Beach fan base, just check out our Showcase Page for details. Are there hotels in the area if I prefer to not camp? Brunswick has many area hotels nearby. Please see Accommodations for a link to the Chamber of Commerce for more details. Certainly! Single day tickets are available in advance and at the gate! Parking is FREE in our Day Ticket Holder lot. Do you allow ticket refunds? Where do I go if I need medical attention, Lost & Found or just have a question? Where can I charge my phone, tablet or other devices? Can I upgrade my single day or 3-day ticket to a four-day? Yes, any ticket can easily be upgraded at the gate for the difference in ticket price. There is a CHARGING STATION available in the Main Lodge “Living Room” available daily Thursday- Sunday. Can I upgrade my Single Day or 3 Day ticket if my plans change? Yes, all tickets can be upgraded at the gate for the difference in ticket cost.